There is a common belief that quilting originated for its utility rather than decoration. The origins of this method of craft are thought to be in the Crusades, when soldiers needed warmth as well as protection from the chafing caused by heavy armor. Additionally, there are ancient Egyptian sculptures showing figures which appear to be wearing clothing which is quilted, possibly for warmth in the chilly desert evenings. In the 14th century, the gambeson was a popular form of armour. In American Colonial times most women were busy spinning, weaving and making clothing. Meanwhile women of the wealthier classes prided themselves on their fine quilting of wholecloth quilts with fine needlework. Quilts made during the early 1800s were not constructed of pieced blocks but instead whole cloth quilts. Broderie perse quilts and medallion quilts were made. Some antique quilts made in North America have worn-out blankets or older quilts as the internal batting layer, quilted between new layers of fabric and thereby extending the usefulness of old material. During American Pioneer days "paper" quilting became popular. Paper was used as a pattern and each individual piece of cut fabric was basted around the paper pattern. Paper was a scarce commodity in the early American west and women would save letters from home, newspaper clippings, and catalogs to use as patterns. The paper not only served as a pattern but as an insulator. The paper found between the old quilts has become a primary source about pioneer life. Quilts made without any insulation or batting were referred to as summer quilts. They were not made for warmth, only to keep the chill off on cooler summer evenings. Harriet Powers, a slave-born African American woman, made two famous story quilts. She was just one of the many African American quilters who contributed to the evolution of quilting. In modern times, art quilts have started to become popular for their aesthetic and artistic qualities rather than for functionality (i.e., they are displayed on a wall rather than spread on a bed). Many types of quilting exist today. The two most widely used are hand-quilting and machine quilting. Hand Quilting is the process of using a needle and thread to sew a running type stitch by hand across the entire area to be quilted. This binds the layers together. A quilting frame or hoop is often used to assist in holding the piece being quilted, off the quilter's lap. A quilter can make one running stitch at a time; this is called a stab stitch.Another option is called a rocking stitch, where the quilter has one hand, usually with a finger wearing a thimble, on top of the quilt, while the other hand is located beneath the piece to push the needle back up. The third option is called "loading the needle" and involves doing four or more stitches before pulling the needle through the cloth. Hand quilting is still practiced by the Amish within the United States, and is enjoying a resurgence worldwide. Traditional Quilting Processes Traditional quilting is a six-step process that includes: 1) selecting a pattern, fabrics and batting; 2) measuring and cutting fabrics to the correct size to make blocks from the pattern; 3) piecing (sewing cut pieces of fabric together using a sewing machine or by hand to make blocks) blocks together to make a finished "top"; 4) layering the quilt top with batting and backing, to make a "quilt sandwich"; 5) quilting by hand or machine through all layers of the quilt sandwich; and 6) squaring up and trimming excess batting from the edges, machine sewing the binding to the front edges of the quilt and then hand-stitching the binding to the quilt backing. Note: If the quilt will be hung on the wall, there is an additional step: making and attaching the hanging sleeve. Piecing: Sewing small pieces of cloth into patterns, called blocks, that are then sewn together to make a finished quilt top. These blocks may be sewn together, edge to edge, or separated by strips of cloth called sashing. Note: Whole cloth quilts typically are not pieced, but are made using a single piece of cloth for the quilt top. Layering: Placing the quilt top right side up atop the batting and the backing, which is right-side out. 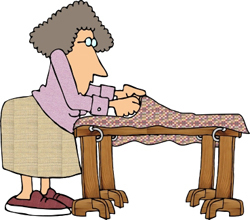 Quilting: Sewing the three quilt layers together, using stitches in decorative patterns, called motifs, or in utilitarian patterns, such as straight lines, using bigger stitches. Borders: Typically strips of fabric of various widths added to the perimeter of the pieced blocks to complete the quilt top. Note: borders may also be made up of simple or patterned blocks that are stitched together into a row, before being added to the quilt top. Binding: Fabric strips cut on the bias or straight of the grain, sewn together, making a long strip that will fit the perimeter of the quilt, which is typically machine sewn to the front side of the edge of the quilt, folded over, and hand sewn to the back side of the quilt. Quilting: Stitching through all three layers of the quilt sandwich, typically by hand or machine in decorative patterns, which serves three purposes: 1) to secure all three layers to each other, and 2) to add to the beauty and design of the finished quilt, and 3) to trap air within the quilted sections, making the quilt as a whole much warmer than its parts; for example, a single layer or all three layers used separately. Quilting is usually completed by starting from the middle, and moving outward toward the edges of the quilt. Examples: simple or complex geometric grids, "motifs" traced from published quilting patterns or traced pictures, complex repeated designs called tessellations, or stitching within the seam line itself, i.e., stitching in the ditch.